One of the biggest revolutions in the app space has come on the back of creative entrepreneurs who take an existing industry and then rip it to shreds. The age old taxi business is a mighty fine example, where company’s like Hailo and Über are ripping up the rule book and innovating their way towards a taxi revolution. Where once we would stand by the side of a busy road and try to hail a taxi, now we’re increasingly turning to e-hailing, rise sharing and the benefits that come from cutting edge apps. The service offered by these apps is now phenomenally popular in London. Uptake has been more pragmatic in the USA, where the app makers have had to fight tooth and nail to get legal permission to operate. Initially banned in New York, they’re now good to go, and other key cities like San Franscisco and Washington are now on board. The services are also roaring into the Far East, gaining immense popularity in places like Taiwan and Hong Kong. The basics are simple. Download the apps – it’s worth getting them all if you’re a typical urban-ite – and set up an account. Hook up a billing account and your good to go. Next time you need a taxi, fire up the app and you’ll see a map. The app picks up your location via GPS (try and use Wi-Fi as you’ll get a more accurate location pick-up) and then hit the pick me up button. Within seconds the app scans for nearby taxis, delivering a fare in typically under five minutes. So why do you need to get involved with this trend? 1) Speed: these apps take the guesswork out of taxi ordering. No need to wonder around looking for an empty cab, these apps deliver the can to you. 2) No need to have cash on you: one of the joys of the system is the way that you can easily pay through the app. Cabs have gotten better at having chip and pin systems in the cab, but its still hugely hit and miss. 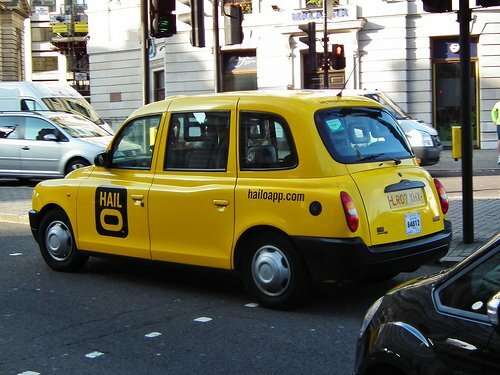 With services like Hailo, you can set up the payment before you even get in the car. 3) Security: You choose the type of cab you use, allowing you to just select licensed black cabs. Therefore, there’s no need to worry about the safety of the cab, especially in light of some of the stories around unlicensed mini-cabs in the UK. 4) Gathering receipts: Use Taxis for work? The E-hailing apps are a god send. No messing around with the paper receipts, instead the app will email you receipt, including any tip you added straight to your inbox. Forward it to accounts and you’re done. 5) Ensure you get home: the big cities come to life when the sun sets, but sometimes in the early hours it can be a nightmare to hail a taxi. If you arm your smartphone with a range of these apps, you’ll have a much better chance of success. This can provide peace of mind to parents too, who want to be sure that their kids are getting home safely. 6) Feedback systems: These apps all include feedback loops, which reward good drivers and mark down the rogue ones. Social feedback loops are a great way to police the taxi system. It’s all still a work in progress, but its a step up on the minefield that we were faced with before these apps came along. There are increasingly some novel ideas shining through in this space too. If you get sick of riding with lifeless drivers and fancy turning your ride into a bit of fun then download Lyft. The app forces you to be sociable, and both you and the driver rank each other. If your an entertainer than you’ll find more cars on your map next time you need a cab. Of you’re boring the opposite applies, meaning you’ll find it a real challenge to get a can through the system again. It’s all a bit of fun and worth Giving it a try. Fun social networking aside, these apps are delivering a technological revolution to the taxi business. They’re good for drivers too, helping to take the guess work out of fare collection and guaranteeing payment. Whatever your motivation, give the apps a download and let us know how you get on.